A fabulous adventure – riding off-roaders across Kazakh steppes towards the landing site of Soyuz spacecraft. 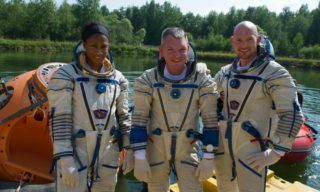 Take a chance to meet cosmonauts back to Earth! Join our exclusive Baikonur launchsite tour with the observation of Soyuz MS spacecraft launch. The nearest tour is timed to Soyuz MS-13 launch scheduled for July 20, 2019. 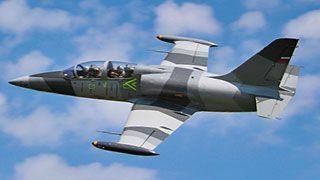 If you want to get unforgettable impressions, perform breathtaking aerobatics and watch the landscapes of Moscow region L-29 training jet flight and L-39 combat training jet flight is exactly what you need. On August 2, 2018 in the Star City was a meeting ceremony of the 54 / 55th long ISS expedition crew, that includes Roscosmos cosmonaut Anton Shkaplerov, NASA astronaut Scott Tingle and JAXA astronaut Norishige Kanai. 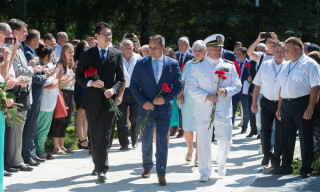 According to the tradition, the crew, as well as the leadership of Roskosmos, the Cosmonaut Training Center, rocket and space industry enterprises and representatives of foreign space agencies laid flowers at the monument to Yuri Gagarin. Roskosmos General Director Dmitry Rogozin awarded Anton Shkaplerov with the medal of Academic Korolev, and Scott Tingle and Norishige Kanai - with medals "Space without Borders". Roscosmos. Crew of the “Soyuz MS-07″ spaceship back to Earth. 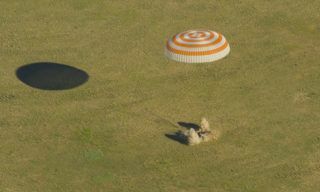 On June 3, 2018, the members of the crew of the "Soyuz MS-07" spacecraft and the expeditions ISS-54/55 returned safely to Earth. 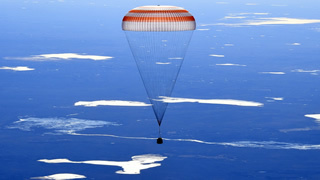 The descent vehicle with the Roscosmos cosmonaut Anton Shkaplerov, NASA astronaut Scott Tingle and JAXA astronaut Norishige Kanai landed in the Kazakhstan at 15:39:42 Moscow time. 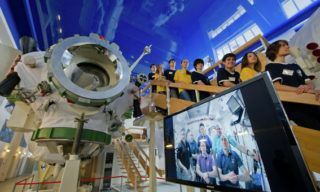 On May 25 the delegation of the Japan Aerospace Exploration Agency led by JAXA President Hiroshi Yamakawa visited the Cosmonaut Training Center. Within the framework of the meeting with the head of GCTC, Hero of the Russian Federation, the honored test pilot of the Russian Federation Pavel Vlasov, further cooperation in the training of cosmonauts and astronauts in the crews was discussed. 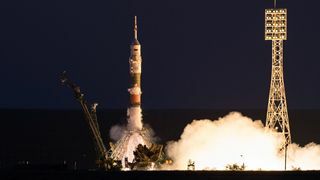 Hiroshi Yamakawa and Pavel Vlasov noted the need for full-fledged cooperation in the implementation of such a grandiose international project as the ISS. On February 5, 2018, NASA astronauts Andrew Morgan and Christina Koch and JAXA astronaut Soichi Noguchi were introduced to GCTC authorities and specialists and started training in GCTC on Soyuz MS simulator and Russian ISS segment simulator to be second flight engineers in the future space missions. Roscosmos cosmonauts Alexander Skvortsov, Ivan Wagner, Sergey Ryazansky, Oleg Artemyev, Sergey Prokopiev, Alexander Samokutyayev, NASA astronauts Scott Teangle, Randolph Bresnik, Andrew Feustel, Janet Epps, ESA astronaut Alexander Gerst and JAXA astronaut Norishige Kanai preparing to go to space in 2017 and 2018 passed water survival trainings in GCTC. New Soyuz MS was launched from Baikonur launchsite on July 07, 07.36, local time. After successful docking on July 09, Anatoly Ivanishin (Roscosmos), Kathleen Rubins (NASA) and Takuya Onishi (JAXA) joined Oleg Skripochka (Roscosmos), Alexei Ovchinin (Roscosmos) and Jeffrey Williams (NASA) onboard the ISS. One more ISS crew successfully completed training on survival in marshy and forested area. For three days Roscosmos cosmonaut Sergey Ryazansky, NASA astronaut Randolph Bresnik and JAXA astronaut Norishige Kanai have been accomplishing the tasks set under severe weather conditions. 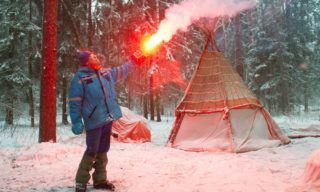 NASA astronaut Scott Tingle and JAXA astronaut Norishige Kanai started their preflight trainings in Gagarin Cosmonaut Training Centre in Star City, Moscow region. 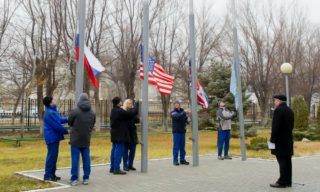 Yesterday, on December 2, 2015, Baikonur say traditional flag-raising ceremony taking place at #17 launchpad in front of “Cosmonaut” hotel. ISS-46/47 mission prime and back-up crews started passing final prelaunch trainings at Baikonur spaceport. 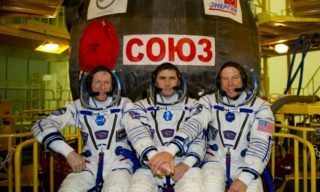 The prime crew includes Roscosmos cosmonaut Yuri Malenchenko, NASA astronaut Timothy Kopra and ESA astronaut Timothy Peake, the back-up crew comprises Roscosmos cosmonaut Anatoly Ivanishin, JAXA astronaut Takuya Onishi and NASA astronaut Kathleen Rubins. 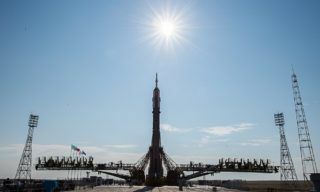 The launch of Soyuz MS-13 spacecraft is scheduled for July 20, 2019. 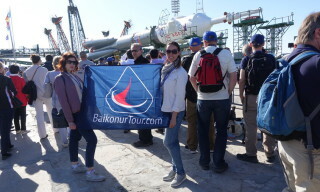 Join our space adventures tour to Baikonur with the observation of the launch! During 5-days space tour you will visit all most interesting places of Baikonur and witness all important prelaunch events.